Canadian Home Love: So Close! Michael was overwhelmed by the amount of time the floor took to put down. It was 2 days longer than anticipated. He got all the living/dining room and the bedroom completed. The kitchen will be done perhaps in September on his next long stretch of vacation time. Oh, the dust. We must have vacuumed 75+ times. Living in the same space that's being renovated = no place to actually live. Look at that detail! Michael is quite proud of the top of the stairs, with all the angles. I made this photo big so you can see his awesome work. Check out that sliver of a plank next to the nosing. It had to be perfectly measured because once it's hammered it, it's not coming out! Speaking of nosing, that handy stain job was my doing. I hate that I'm pointing this out, but I, too, put my mark on our house. Do you notice it? Yeah, my fingerprints are permanently set on the top of the stairs. It was hard staining and polyurethaning while it sat vertically on the saw horses :o/ Whoops. Once satisfied with the living/dining area, it was on to the bedroom! Luckily I had some adhesive felt pads from living in Austin that we were able to use on our bed frame and wardrobe so as to not scratch the new floor. It would have been devastating if we hadn't. Once the bedroom floor was complete, baseboards were installed. I still have to fill all the finishing nail holes and paint over them, but they really add the finishing touch to the room. Michael painted all of them CIL trim white before the install. The inside of the closets need to be painted and the doors put on, which is what I'm hoping Michael is doing as I write this post from work :) I'm a tough boss to work for! Obviously things are still in disarray. Our bedroom dresser is shoved in the corner with the two couches an all the other large items that have to place right now. I can't wait for the baseboard to be 100% complete so we can put furniture in place! 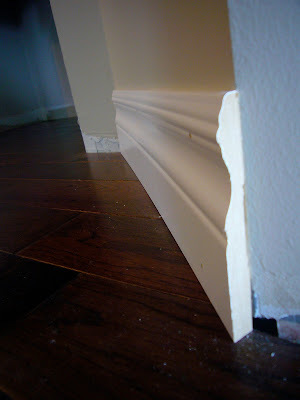 We love the baseboard profile and with the angles on the closets you can see it well, along with the crown molding. Ooo la la! I will be posting some great finds that I got from the Habitat ReStore, staining projects I've undertaken, and thoughts on how I might tackle our living/dining room layout. Stay tuned! The floors look awesome!! must feel so nice to be so close to putting things back together!! I love the floors, they look AMAZING!!! Your hubby is a keeper. :) Great job!